What Is the Difference Between a Char Broiler & a Grill? Cooking appliances differ between home and restaurant kitchens. 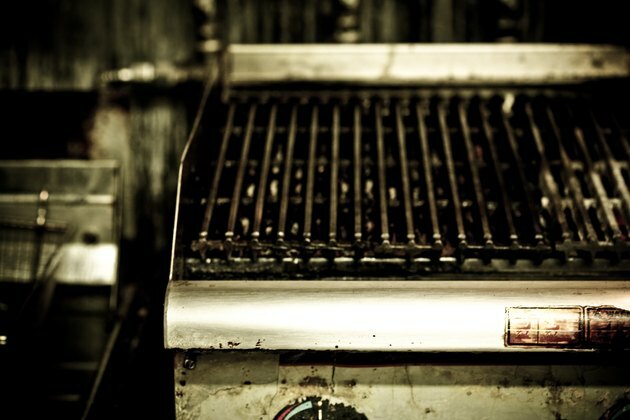 The grill used by homeowners is similar in many ways to commercial charbroilers, but there are distinct differences, too. You might own a smaller version of a charbroiler in your kitchen without knowing it. The lidless grill used in commercial kitchens is called a charbroiler. The structure of a charbroiler and grill are similar in many ways. Both have grill grates above a heat source. Charbroilers generally use a gas flame under lava rocks or an electric heating element to create radiant heat to cook food placed on the grill grate, but they are open and do not have a lid. Grills consist of grates atop a firebox for holding charcoals or gas burners or propane burners. The lid on an outdoor grill can be closed to trap flavorful smoke in the cooking box for adding flavor to foods that must cook slowly. Generally, charbroilers are for use indoors. If they have an open flame they also require a powerful ventilation hood above the cooking surface to exhaust smoke and cooking gases out of the kitchen. Grills are used by home cooks outdoors to provide natural ventilation. Charbroilers use gas or electricity to heat the grates for cooking food. If gas is used for a charbroiler, a gas line is connected directly to the appliance. In this respect, they are similar to high-heat cooktops.Grills can use gas, propane or charcoals. Most often, outdoor grills use an exterior propane tank or charcoals, but built-in units might have a dedicated gas line. Gas and electricity for a charbroiler are easy to control and more responsive to slight temperature adjustments. With a grill, the home cook using charcoals has to resort to estimating the temperature by holding a hand above the charcoals. Charcoal grills take longer to preheat and it is not very easy to change the temperature quickly. For success with a charcoal grill, prior planning is paramount. Gas grills have a similar responsiveness as gas charbroilers, and these grills are often equipped with a thermometer to monitor the temperature inside the grill for more precise cooking. Charbroilers and grills can be used to cook many of the same food items, but since charbroilers do not have a lid, they are best for searing foods quickly over high heat. If you want to slowly grill thicker pieces of meat or enjoy a whole smoked chicken or turkey, you will need a lidded outdoor grill that can be adjusted to cook over low, indirect heat. Restaurant charbroilers, can be larger in size and able to handle large quantities of food that a home grill cannot. If you have a grill insert on your stovetop, you have a miniature version of a charbroiler in your home. Use it as you would an outdoor grill to enjoy grilled steaks and hamburgers even in winter. Athena Hessong began her freelance writing career in 2004. She draws upon experiences and knowledge gained from teaching all high-school subjects for seven years. Hessong earned a Bachelor in Arts in history from the University of Houston. What Is the Difference Between a Panini Grill & a Press?